Do you have a wall/light switch that is causing you some problems, or that you suspect might be faulty? Problems with a light switch is something most homeowners experience at one time or another. The problems can present themselves in a number of different ways, and resolving the problem is obviously very specific to each situation. 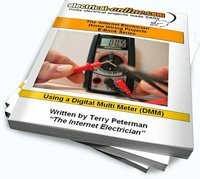 In this post I review three common light switch wiring problems, how to troubleshoot the actual cause of the wiring problem, and how to resolve it. Why do I have to tap on my switch to make it work? Uncle Terry, why is one of my switches getting warm to the touch? What is wrong inside the switch box in the bathroom of the condo I’m living in for the next three months? I hear an audible buzz from inside the switch box in conjunction with the dimming of the lights. To Dave and Kari, I’ll give you the short answer. As for myself, I’m going to take you with me on a real life video investigation into my problem. I’ll call it: “SPI Tamarindo” (Switch Problem Investigation). The common single pole switch is one of the simplest electrical devices that you have in your home. All they do is interrupt the flow of electricity to a device (like a light fixture, ceiling fan or a switched receptacle) by making (closing or turning on), or breaking (opening or shutting off) a circuit. Check out this article on the website for details on the most common ways to wire a single-pole switch. Note that method #1 which I feature has been widely used over the years, but for various reasons is now the least desirable method, and in fact is against code now in many jurisdictions. I present it as this is likely the wiring scenario you will be seeing if you have older homes. Another good resource to help you understand both single-pole and 3-way switches is this video, which uses a visual demonstration to help with the explanation. So what can go wrong that would lead to Dave’s situation of having to ‘tap’ on the switch to make it work, or why is the switch in Kari’s house getting warm to the touch? In both cases, it is either a problem with the switch itself, or the connections to the switch. The only other scenario that could be in play for Kari would be if she recently made some changes to the fixture or fixtures controlled by that switch, such as drastically increasing the load by either adding more light fixtures, or putting in larger than rated lamps in the existing fixture or fixtures. More wattage causes more current to flow, more current flow creates more heat. However, this was not the case. That brings us back to connections or device failure. Switches are a mechanical device, and mechanical devices wear out. Every time you turn on or turn off a switch, there is a tiny ‘arc’ or ‘spark’ as the contacts make and break. This arcing can cause electrical wear, or a pitting of the contact surfaces, and cause extra resistance to the flow of electricity. Extra resistance produces heat, heat can damage the mechanism inside the switch, and this can make the switch warm to the touch, or cause it to quit making contact entirely, requiring an encouraging ‘tap’ on the switch to make it work. The tapping will eventually cease to work as the damage gets worse. For all the same reasons, poor terminations (connections) of the wires to the switch can cause the same problems. I see a higher failure rate when the push-in terminals are used instead of properly connecting the wires to devices using the terminal screws. Watch part six of this video series to see how to make proper connections to a switch. So to Kari and Dave, you need to replace these troublesome switches, or at least open things up so you can see what is going on in your particular situations. Start by reviewing proper electrical safety practices. Shut off the power, and make sure it’s off. When you are sure the power is off, then remove the faceplate, and remove the device or devices that are giving you trouble and see if you have a problem with poor or loose connections to the switch. It should be obvious if there is a problem and it may show itself as discoloration, or blackened wires, and even signs of melted insulation on the wire near the connections may be apparent. If the connections to the switch look good, then replace the switch in question and carefully put everything back together as it was. Restore power and see if you have fixed the problem. Kari, you can monitor the switch and see if it no longer gets warm, and Dave, see if the switch now works without beating on it! Now, come with me on SPI Tamarindo, and the mystery of the buzzing switch box. I hope it’s not a big ugly tropical insect inside there causing the problem. Watch the video and see if I scream like a schoolgirl. Troubleshooting and replacing a faulty switch is a project easily handled by most DIYers, provided you follow the proper safety guidelines, and take your time making the proper connections to the new device. This entry was posted in How-To-Videos, Switches and tagged common light switch wiring problems, light switch, light switch wiring, switch. Bookmark the permalink.